BIOTECH, an Organisation formulating and implementing new projects for decentralised waste treatment, had designed yet another improved waste treatment biogas plant. In the waste treatment biogas plants, now being commonly used it is usually observed that mosquitoes are multiplying in large numbers and laying eggs in the narrow space existing between the gas holder and the digester of the plant. If four of five drops of kerosene are sprayed along the edges of the plant the mosquito larva can be fully destroyed in no time. In the case of water jacket model plants the multiplication of mosquitoes can also be controlled, if some guppy fish are grown inside the water jacket. But most of the people cannot find time to give sufficient attention to such matters, in view of the busy schedule of activities they have to undertake in their daily life. As a consequence a wrong notion has widely been spread to the effect that, installation of biogas plants will lead to the increased growth of mosquitoes. It is in this context, the research for designing a plant, after rectifying the common defects noticed, which will be acceptable to all and which will be free of mosquitoes was successfully completed under the able leadership of Dr A Sajidas. As a result a most modern biogas plant which will radically change the existing perceptions of biogas plants, having as many as nine special features was designed. In this plant apart from the production of cooking gas by the treatment of bio waste, there is no possibility for the growth of mosquitoes. The gas collector of this plant is capable of storing more than 50% of the quantity of biogas stored in other biogas plants of similar size. There are also facilities for regulating the high pressure generated inside the plant, and also to allow the gas to reach the stove even with the high pressure. The main impediment for the commercial growth and expansion of the sale of portable biogas plants is that these require more space for the transportation from one place to another. But nearly 50 new model plants of BIOTECH can be transported at a time by making use of an ordinary truck, where as only 10 plants of the previous model plants alone could be transported earlier. The patent registration of this plant has already been completed. Those who are interested to fabricate this plant on commercial basis, BIOTECH is prepared to provide all the required technical support. 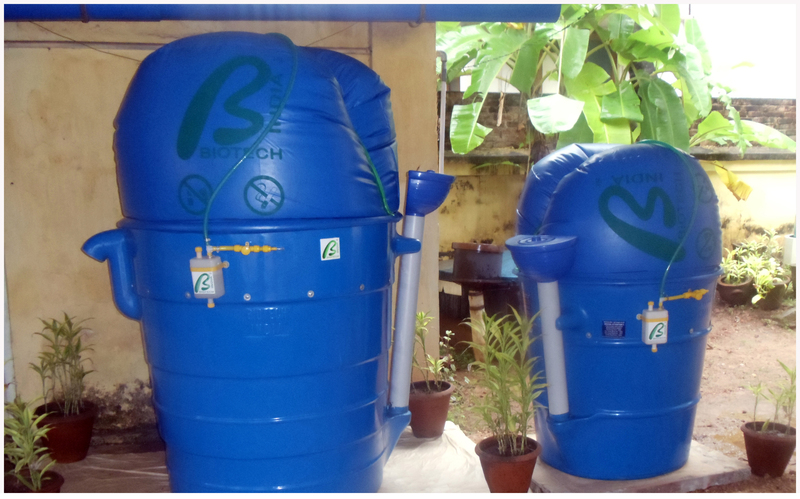 Arrangements have been made by BIOTECH to provide facilities for those who had already installed biogas plants and who propose to convert the existing portable biogas plants as mosquito’s free ones. This plant will be made available to the public at BIOTECH office from November 1st “the Kerala State formation day”. With a view to enabling the public as well as the beneficiaries to examine the plant and to register the plant an exhibition for a period of one week commencing from November 2 to November 15 has been arranged at the Central Office of BIOTECH functioning at Vazhuthacaud, M P Appan Road. The exhibition time will be between 10 am and 5pm on all days. Further particulars can be obtained on contacting 94460 00771, 94460 00904 At this time when every one is seeking fervently appropriate programmes for decentralised waste treatment, this most modern plant of BIOTECH will no doubt create a massive movement in the Society.